Seems like this chart gets updated once a month, so this one is not 100% up to date yet (last updated 10th September). As I said, all the credits to the folks over at r/HiatusCharts! Wow, the gapage has gone up massively in the past two years... especially this year. I wonder if he's got any family to help take care of himself? It's age. He can't work at a pace of only 3 hours for sleeping per day. His editors are aware of it so they highly ask of him to have breaks so he can redo his schedule and work in a less stressful situation. Also, it's not like he doesn't do anything during the hiatus / breaks. He still has meetings with his assistants to plan the next cases, does the drafts to then proceed to polish them up. Of course, he also has his fun (Kan Colle, Animal Crossing) and does help in the yearly movie by drawing some keyframes and the teaser posters. The Post December Four Month Hiatus was, according to a report on a german Conan Fansite not Gosho's own idea, but of his editors. Gosho himself stated, that he overworked himself in 2017 with work on both the manga and the movie. This isn't actually uncommon in the mangaka business, that artists having health issues because of exhausting themselves too much. 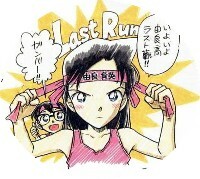 And as said, Gosho is already 55. S.Vineyard wrote: The Post December Four Month Hiatus was, according to a report on a german Conan Fansite not Gosho's own idea, but of his editors. I'll be honest, I don't really believe that. For starters, when the hiatus was first announced, it was said in the message that it's because of medical treatment and recovery, so it was weird for them to note later "oh no, it was the editors' idea". We're talking about a 4 months hiatus, which hardly sounds like something the publisher would be interested in, but that's besides the point. While I'm not saying Gosho is in a really bad shape or terminally ill, I do think there's a bit some stuff going on that they're not telling us about. Because here's the reality, just because they say things are fine, doesn't mean everything is fine. The information we get from Gosho or Shonen Sunday is propaganda, not necessarily the absolute truth of the matter. Like, you know how when there's a break announced, the default reason given in the manga is "research"? (like how it was once again noted so for the latest 9 weeks break). Just because it said the reason for the break is research doesn't really mean it's true, as it's (as noted) a default reason given for breaks not just in this manga but in other manga as well. Instead of research, Gosho will probably be spending most of his time resting (which is fine) or playing with his ship waifus in that video game he tends to gush about (which is also fine... ish... not exactly showing a refined taste there but whatever). The maximum number of chapters we'll potentially be getting out of 2018 is 17 (and it could be lower if Gosho takes another break in December), and currently it doesn't seem like the manga will get back to regular publication maybe ever. I guess the bottom line of this post is that the information we get about what's going on behind the scenes isn't necessarily always reliable when the source is Shonen Sunday and the publisher. They won't tell us what they don't want us to know. Also Gosho's most impressive year was 2005 when you consider that the panels were bigger and more detailed at that time than ever before. He was probably on steroids. I do think 2019 will probably have more cases than 2018 did, if only like one more or something, just because of that long hiatus. The chart is a bit weird because it confuses issues and years. Going along with issues the 2018 Shônen Sunday calendar year (December => November) will have one more chapter in issue #53 so 16 chapters overall. I also expect 2019 to bring in a few more chapters, probably 20-22 or so, which I guess is fair enough after 25 years.